DISCLAIMER: None of the following is intended to be investment advice. Also, full disclosure, any links to Coinbase and Binance, etc., include referrals. It actually benefits you to use them because we will both get an extra $10 worth of BTC for free if you deposit at least $100 to Coinbase. Thanks in advance if you follow the links when you make your accounts — and even if you don’t, I hope you find this article useful! You’ve heard of Bitcoin. Maybe it was because you saw it on the news, or perhaps a friend let you in on the secret. Maybe you heard that Bitcoin can make you rich and you don’t want to miss out. Maybe you heard that Bitcoin is a scam and you want to learn about the controversy. Maybe you heard Bitcoin is going to change the world and you’d rather not be left behind. Maybe you heard any or all of these things, and you’re simply curious about what the big deal is. Regardless of what you’ve heard, one thing is for sure. Like many others, you’ve been asking yourself one simple question: “What is Bitcoin?” So, you looked online and found this article. Lucky for you, you’ve come to the right place. My name is Malcolm Rose, and I’m here to help. Before we go any further, however, I want you to take a moment to make accounts on two crucial sites: Binance and Coinbase. Follow the links and make accounts on each. Don't worry - this won't take more than a minute or two. It will also be time well spent since these accounts will be invaluable for your future as a Bitcoin owner! All right. Got your accounts made? Good. Welcome to the only primer you’ll ever need to get a basic understanding of the revolutionary technology known as Bitcoin. If you’ve tried to look into this before and immediately been swamped with buzzwords and technobabble, have no fear — my main purpose in writing is to trim away all the confusion and allow people like you to understand this exciting, cutting-edge technology instantly — and the best part is that you can do this without having to spend several years getting a Computer Science degree first! So, really — what IS Bitcoin? Bitcoin is a worldwide virtual currency (“cryptocurrency”) you can send for little to no fees which is not controlled by any government, corporation or individual. Bitcoin and other cryptocurrencies can also be thought of as something similar to a stock or — to a small degree — a company. Like stocks, they have “tickers” — Bitcoin is “BTC,” Bitcoin Cash is “BCH,” Ethereum is “ETH,” and so on and so forth. Like stocks, people trade them on the open market and this helps to determine their price. Of course, cryptocurrency is also very different from stocks, and I’m going to tell you how. What can Bitcoin do that regular money can’t? How does one “buy” Bitcoin? How does one safely “hold” or “own” Bitcoin? These are the practical things that you are probably most interested in knowing about this technology. Let’s get right to it; just keep reading and you will soon understand the answers to all these questions and more! With Bitcoin, I could send money from New Zealand to Spain — these countries are almost exactly on the opposite sides of the planet, mind you — and I could do it in minutes. By way of comparison, Western Union takes days if you want the money in your bank account. Payment processors. Ever had a PayPal, Stripe, or Venmo account? Horror stories abound of payment processors freezing people’s hard-earned money for months — often for completely absurd reasons. If you’re trying to run your own business, these problems multiply; you’d be surprised what kinds of payment processing problems you can run into in the simplest of enterprises — and if your account is shut down, how are going to keep running your business? Banks. You might not think of a bank as a middleman until they have a problem with you or something you’re doing. Banks have been known to mistakenly close people’s accounts for no reason at all, or because they frivolously deem your account to be “high risk.” This sort of thing happens to business owners all the time for a variety of reasons — and no, I’m not just talking about the guys running marijuana dispensaries. And by the way, your bank also likes to surprise you with unexpected fees for a variety of asinine things — Bitcoin cannot and will not do that. Governments. Now, I know what you’re thinking — “I’m not a criminal, why do I care if the government can freeze my money?” Well, that’s all well and good if you’re living under a benevolent government. But what if you are living in a banana republic like Venezuela? If it wasn’t for Bitcoin, a lot more people would probably be starving down there right now — after all, their own national currency is worthless, and their dictator has made importing foreign currencies mostly illegal. Bitcoin has quite literally saved lives there. These are just a few examples of the actors that have the ability to stop you from sending your money wherever you wish. With Bitcoin, there is no middleman. You are able to send this cryptocurrency directly from one person to another and, without getting into the technology behind it, no one can stop you. As you can see, Bitcoin has a lot of capabilities. But is there a good reason why the cost has continued to rise? Is it really “digital gold” like everyone is saying? Oh yeah?! What makes the US Dollar valuable? It’s just a piece of paper and some ink! It’s a fair point —after all, the American dollar used to be backed by gold, and now it’s backed by faerie dust, unicorn dreams, and — let’s not forget — whatever the guys at the Federal Reserve feel like on a given day. 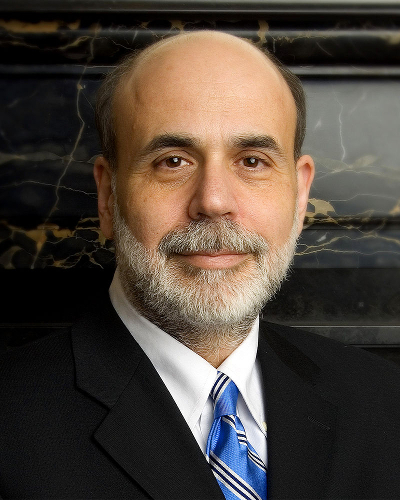 Hi, I’m Ben Bernanke. I used to work at the Federal Reserve and men like me help make sure your money is worth less and less every day. I love inflation! With that said, I don’t think this is a very good way to persuade people to be interested in Bitcoin. It’s actually an example of “tu quoque” — a logical fallacy where someone accuses you of something and you simply point the finger back at them in response. It’s not enough for the country-based currencies like the US Dollar to have dubious valuations; Bitcoin needs to be better than them. So, let’s be frank: why should anyone take Bitcoin seriously? Why should it have ever been worth around twenty thousand dollars per coin? Was that old dinosaur Charlie Munger right when he childishly compared Bitcoin to “trading turds”? Well, first of all: ew. Secondly: there are very good reasons why people are valuing Bitcoin so highly, and there are even better reasons why its value could rise orders of magnitude higher in the future. First of all, everything I wrote about “what Bitcoin can do” also functions as a great argument for why Bitcoin has value. The true, tangible value of a thing is what you can do with it: precious metals can be used to make semiconductors, gas can run vehicles, and paper money doesn’t really do anything. With Bitcoin, the value partially comes from what it can do — the fact that it can be transferred from person to person with so few hurdles, unlike money in a bank account. When it comes to the value, however, the most important thing about Bitcoin is the fact that it is deflationary. By comparison, almost every single traditional currency — including the green pieces of paper in your pocket — is inflationary. What does this mean? Well, there’s a reason why your great grandparents might talk about being able to buy a loaf of bread for a dime — our money used to be worth more. A lot more. As governments print more and more money, the prices of pretty much everything rise or “inflate” to compensate — hence the term inflation. By way of comparison, you can’t print more Bitcoin. Sure, you may have heard of “Bitcoin mining” — a process by which “new” coins do enter circulation — but because of the way the system is set up, there will only ever be 21 million bitcoins ever made. This has led to Bitcoin being referred to as “digital gold” — after all, you can mine more gold, but you can’t create more of it out of thin air. Our planet only has so much. “Assets” like gold have often been used as “stores of value” — a place to put your money which is not affected by traditional currency problems like inflation. Think this is something only rich people need to care about? Think again. People lost their homes and livelihoods in 2008 because of a broken financial system. People lost far more during the great depression. This sort of thing affects everyone. Speaking of being rich: don’t think that you have to have a lot of money to invest in cryptocurrency. Bitcoins are divisible, just like dollars and cents — you can own 0.0005 bitcoin (or about four dollars at the time of this writing) if you’d like. While there’s some debate as to whether Bitcoin should be more of a currency or more of a store of value — and I’ll talk about that a bit more later — one thing is for sure: this is an emerging technology that is going to change the world. The best part is that even now we are on the bleeding edge. If you invest Bitcoin or any other cryptocurrency today, you will be on the bleeding edge of progress — you will be an “early adopter.” Don’t believe me? Imagine if Bitcoin was valued similarly to the current credit card companies. If you add up all four major card companies, you’ve got a market capitalization of about six hundred billion dollars. Bitcoin’s current market capitalization? About a sixth of that. What this means is that if people started valuing Bitcoin the same as they do the current credit card system, you’d be seeing a price of Bitcoin hovering around $35,000. If people started valuing Bitcoin more like gold, Bitcoin would be closer to $500,000 per coin. Still think you can’t be an early adopter? Think again. All that’s left is to learn how to buy this stuff. Before we get to that, though, there is a couple important issues to discuss. Bitcoin Cash (“BCH”) is a cryptocurrency which “forked” off of Bitcoin in August of 2017. This “fork” occurred over both ideological differences and a difference of opinion over the best technical ways to handle “scaling up” the coin’s ability to handle its increasing popularity. To hear the BCH supporters tell it, Bitcoin Cash is actually “the real Bitcoin.” This is a matter of opinion and at the time of this writing, I personally have not weighed in on this “scaling debate” in any substantial way. What I will say right now is that both sides make interesting points, and it will be exciting to see which coin survives and thrives on its own merits in the long term — and it could very well be both! This is not a frivolous debate, mind you — the problem of “scaling” affects things like how quickly the networks send transactions and what sort of fees you pay to do so. I encourage you to research the difference for yourself; just be advised that there are rabid supporters on both sides of this argument and their tempers often flare quite hotly. Here’s the bottom line: if you’re looking for the “Bitcoin” that comes up when you Google search for “Bitcoin”, or the “Bitcoin” you heard about on the news, you’re probably not looking for Bitcoin Cash. BCH supporters may crucify me for saying so, but that is certainly the case — at least for now. With that said, you would not be remiss if you also looked into getting some BCH for yourself (and BTC supporters may crucify me for saying that). In any event, the good news is that getting BCH is as easy as getting Bitcoin — you can get it directly from Coinbase! While Bitcoin was the first cryptocurrency, it is not the only one. There are hundreds, and they are poised to change the world in a variety of ways — I’ve written extensively on these “altcoins.” You would not be remiss to look into these articles, all of which can be found in my archive. The long story short is that most of these “altcoins” are not available on Coinbase — to buy them, you’d instead have to make an account on another exchange like Binance. See my other articles for details! However, you’re here to learn about Bitcoin, so without further ado, it’s time to talk about how to buy some. Congratulations for making it this far: you are now just minutes away from owning some of your very own BTC! If you’re looking for the simplest path to buying Bitcoin, you want to start out on Coinbase. This is arguably the most trusted “exchange” currently on the market. You can think of them as the PayPal of the cryptocurrency world, with all the good and bad connotations that come along with that. There are some countries where this is not the case! For example, in Canada, one would probably want to use QuadrigaCX instead. Unfortunately, that’s outside the scope of this guide, but I do have a country-by-country guide which may help you if Coinbase doesn’t work in your area. Once you are up and running there are a number of options when it comes to actually paying for coins via Coinbase. It is possible to link your bank account to Coinbase but actually transferring coins out of Coinbase will be impossible for a few days while the funds are clearing. If you’re in a rush, I would recommend you link a credit or debit card to Coinbase instead. This will allow you to purchase some amount of coins immediately, and then immediately send them off wherever you want — your wallet (we’ll talk more about wallets in a bit), another exchange, etc. Whatever method you choose, all you have to do is click “Buy/Sell” at the top of the screen and follow the instructions presented to you. Actually “buying” the coins is very straightforward from there — just keep clicking through and following the instructions. By the way: at time of this writing Coinbase offers four coins: Bitcoin (BTC), Ethereum (ETH), Litecoin (LTC), and Bitcoin Cash (BCH). Even without moving to another exchange like Binance, you can branch out from Bitcoin! I recommend you do your research and decide if you’re interested in owning any of these coins. If you want to be done now, you can be — but there are more steps if you want to be security-conscious. For maximum security, I wouldn’t leave your coins in the exchange. I like and trust Coinbase, but ANY site can be hacked or experience downtime — even massively established trusted sites like PayPal. Furthermore, remember those “middlemen” we talked about? Coinbase functions as one of them, particularly if you’re leaving your coins on the exchange. You want to have full control of your coins. My usual suggestion is that price-minded people buy an inexpensive Android phone with the Coinomi app, which is a very robust and secure “multi wallet” which can handle many different cryptocurrencies in addition to Bitcoin. If you prefer absolute maximum security, however, there are “hardware wallets” which are ultra-secure physical devices which exist only to safely store your crypto. The Ledger Nano S and the Trezor are great examples of these. I have written an overview of Bitcoin wallets which focuses on Coinomi; it can be found here. It would be advisable for you to take a look at this after you buy some Bitcoin - with my guide it will be very simple and straightforward to use your new Bitcoin wallet! Be advised that the information here only scratches the surface on Bitcoin and cryptocurrencies in general. I recommend you read as much as possible. Cryptocurrencies are the future, and if you’re reading this guide you are already lightyears ahead of the curve.